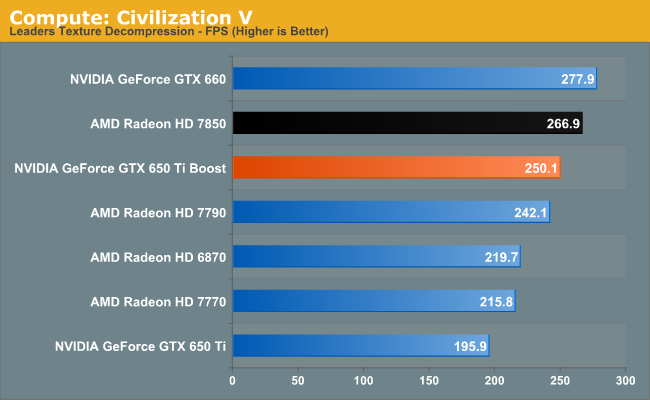 As our Civilization V compute benchmark is just that, a compute benchmark, so our results aren’t too surprising. 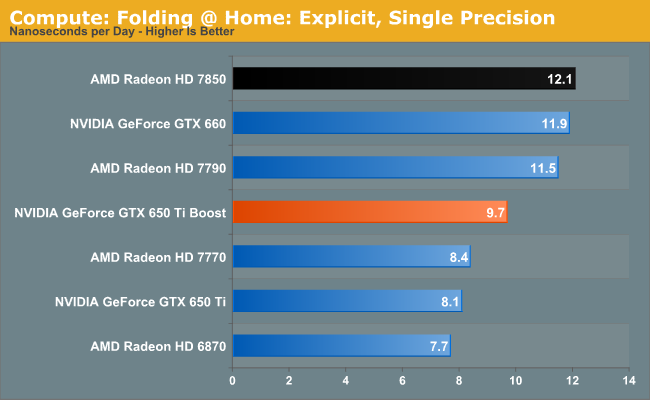 This is one of the few compute tests NVIDIA does well at, so the GTX 650 Ti Boost is close to both Radeon cards, and not all that far behind the GTX 660 either. 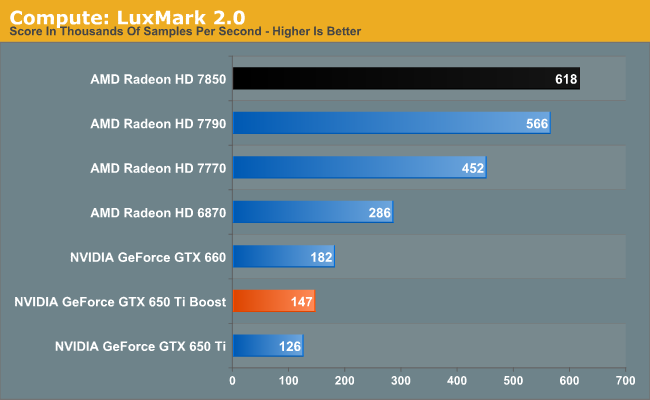 Moving on to LuxMark, we quite frankly transition into a more normal compute benchmark pattern for NVIDIA, which sees Kepler flopping. 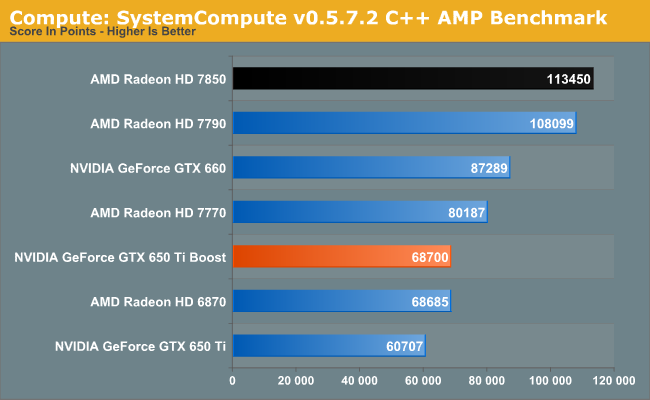 The GTX 650 Ti Boost can’t get even remotely close to a 7770, let alone the 7850. On the NVIDIA side it doesn’t help that since this is a compute benchmark the GTX 650 Ti Boost gains fairly little over the GTX 650 Ti. 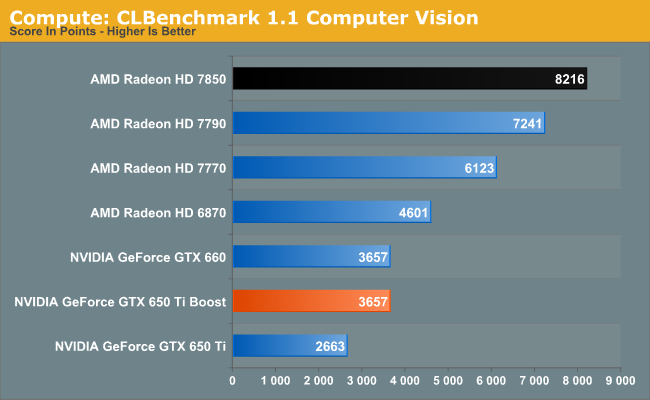 CLBenchmark is much the same as LuxMark, with NVIDIA cards bringing up the rear. 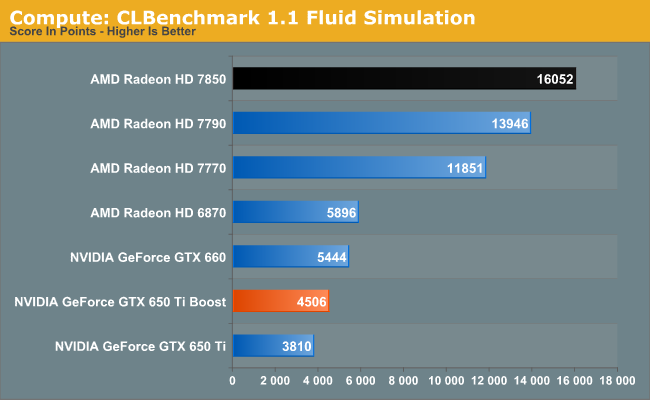 The fluid simulation ends up being the more painful of the two benchmarks for the GTX 650 Ti Boost, clocking in at less than 1/3rd the performance of the 7850. NVIDIA still struggles at compute with FAHBench – the move to OpenCL isn’t doing them any favors – but it’s not the blowout that was our last two benchmarks. Interestingly explicit favors NVIDIA more than implicit, which may mean NVIDIA is handling the overhead better than AMD is. 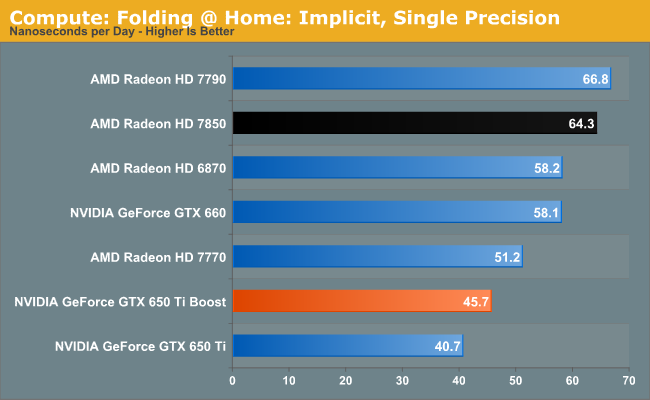 Still, any Folding @ Home users will be far better served by AMD than NVIIDA here. 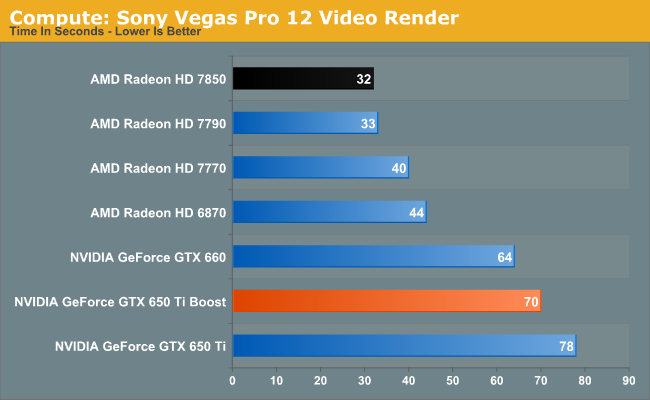 Vegas is another OpenCL benchmark, and another benchmark NVIDIA brings up the rear with. Certainly the additional compute performance of the GTX 650 Ti Boost over the GTX 650 Ti is helping NVIDIA here, but it can’t make up for a gap of over 30 seconds. SystemCompute mixes things up a bit with its multiple sub-benchmarks, but it still doesn’t change the fact that Kepler and GTX 650 Ti Boost just don’t do that well in most compute scenarios. 68K points is enough to tie the 6870 of all things, itself not a particular good compute card. Otherwise the bar is set by AMD at over 100K points. They say why in the article. I think I'd read it before commenting. "Please note that the GTX 650 Ti Boost NVIDIA is sampling is the 2GB card. We’ll take a look at 1GB cards later once those arrive, since they were a late addition."